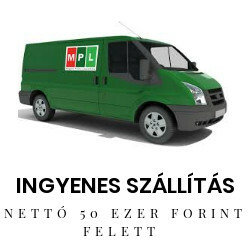 Két működési mód támogatása: Master mód és Slave mód. A Master mód támogatja a csatlakozást több Modbus RTU készülékhez RS-485-ön keresztül. 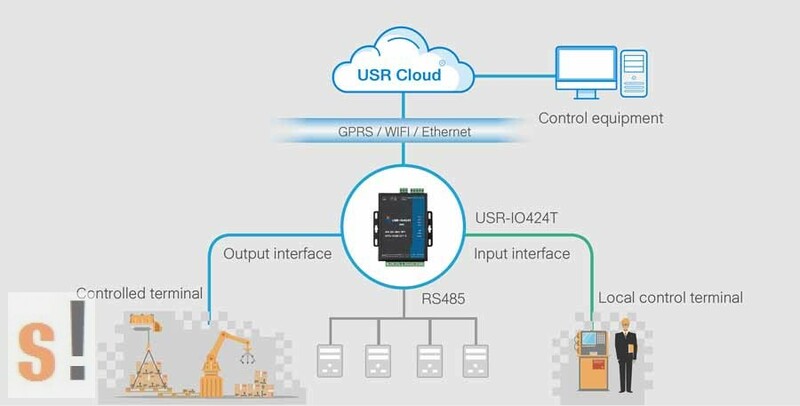 USR-IO424T-EWR is network IO product which supports 4-way input/output, 2-way analog quantity detection, 1-way temperature detection and Modbus RTU/TCP protocol. Take ‘Remote control’ as core function and have high usability. 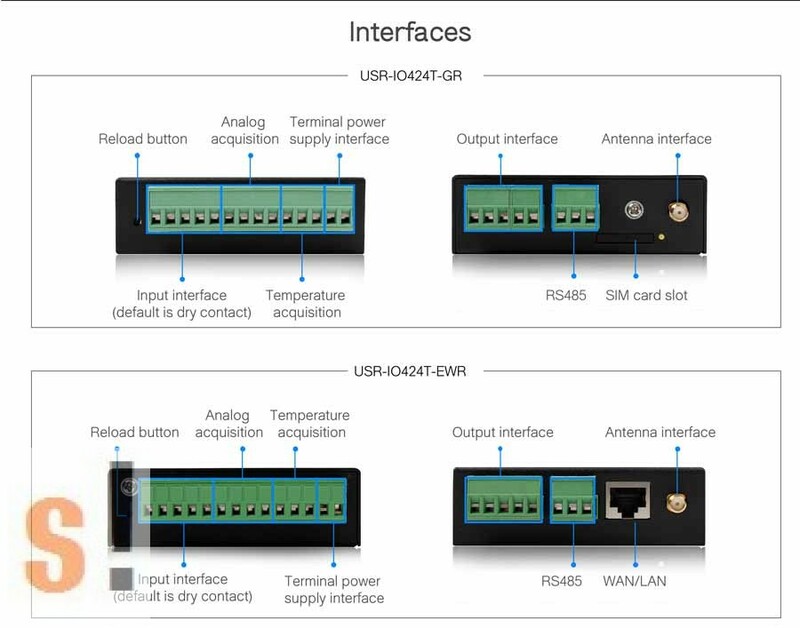 User can easily and quickly integrate USR-IO424T-EWR into own system to realize remote control which based on Ethernet and local control which based on LAN(WiFi) and RS485 . Support 4-way input, default is dry contact. Support 2-way analog input, default are voltage detection. Support 1-way PT100 temperature input. Support 8 conditional control command. Support Web Server to configure IO424T-EWR. Support various function code: 0x01, 0x02, 0x03, 0x04, 0x05, 0x06, 0x0F, 0x10. Support socket to connect to remote server and TCP Client. Support two work modes: Master mode and Slave mode. Master mode supports connecting to multiple Modbus RTU devices by RS485 cascading connection. 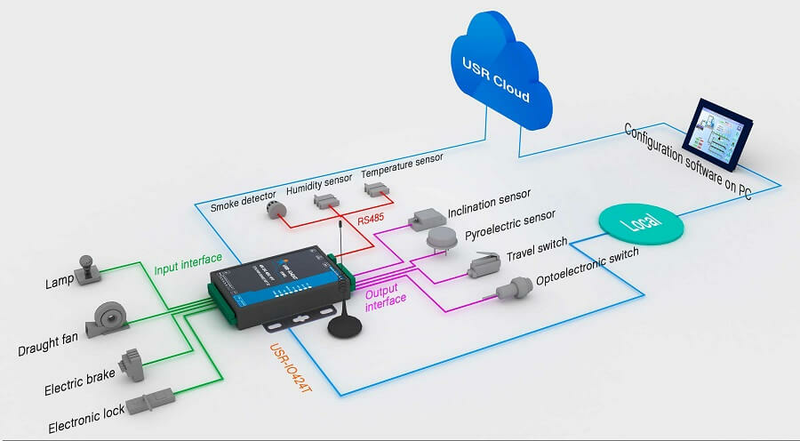 Adopt Modbus RTU protocol data processing. Support Modbus TCP/RTU protocol adaptation. Support connecting to USR Cloud. Support various LED to indicate work status. Support power supply over-current, over-voltage, anti-reverse connection protection.